A sample board at Regal showing the many different kinds of finishing they do. Did you know that there is a Garment District company called Regal Originals, 247 W. 37th Street, that does all sorts of cool things, like pleating, shirring, smocking, appliqué and more? I recently was treated to a tour of this unionized factory by Rodger Cohen, whose father-in-law, Holocaust survivor Jack Krinick, opened Regal in the Garment District in 1950. Today Rodger and his daughter Dalia run Regal, along with 15 to 30 employees, depending on time of year and demand. Readers, can I tell you how incredibly cool it is to see finishing touches like pleating and shirring being applied to actual garments from the likes of Theory, Nanette Lepore, Milly, Betsy Johnson and Oscar de la Renta? Speaking of Oscar, Rodger and Dalia let me peek at a de la Renta navy silk gown Regal trimmed with rows of pleated ruffles; can't wait to see which celebrity wears this beauty on the red carpet. My tour was so interesting, but here's the most exciting fact I learned: Regular home sewists like you and me can hire Regal to do pleating and other specialty stitching for us. They charge approximately $50 per sample (or garment in home sewists' case), and they will walk you through the process, teaching you how to prep your garment, what kind of pleating will work for your garment, and more. Rodger made me feel confident his staff would hold my hand through it all and wouldn't treat me like the babe-in-the-woods I am when it comes to sophisticated garment finishing. Personally, I think $50 is an extremely reasonable price to pay to have a garment professionally pleated, when I think of all the time a home sewer would have to put into her garment to get results that come even close to professional-looking. If I was making a special occasion dress that needed pleating or shirring or some finishing, I'd definitely hire Regal to do it for me. There is an excellent PDF document called "The List" on Regal's web site that does a much better job of explaining who the company is and what they do. Definitely take a look at it (you'll find it on the lower left of the web site). Thanks, Rodger, for a great tour, and I hope this sends some Shop the Garment District readers your way soon. Josephine has been with Regal for over fifty years and has been cross-trained on all the company's finishing techniques. The number of workers at Regal expands and contracts depending on the volume of work at any given time. Have You Taken a Sewing Class in NYC? A reader emailed me today, asking where he could take a tailoring class in NYC. I advised him to check out FIT and Parsons, as these two educational institutions always seem to have the most advanced sewing and patternmaking classes around. Beginners and advanced beginners looking for classes in the NYC area might want to check out Sew Fast Sew Easy and The Sewing Studio. But aside from a "sit 'n sew" taught by Susan Khalje and Kenneth King here in the Garment District, I personally haven't had the opportunity yet to take a sewing class in NYC. What about you, readers? Have you taken a sewing class in New York City? What did you think about it? Please share here. Coming next week: A glimpse behind the scenes at Garment District trimming factory Regal Originals…. Around the World fashion magazine store has a second location in the heart of the Garment District. Not quite sure when this store opened, but there's now a second outpost of Around the World, the best place in the city to buy fashion magazines from, well, around the world. Located in the heart of the Garment District at 148 W. 37th Street, just off Seventh Ave., home sewists can pick up single issues of BurdaStyle at this location for $9.50 an issue. 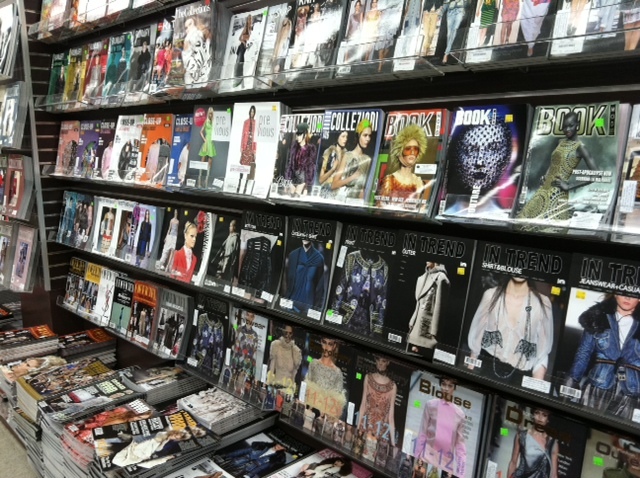 The amount of fashion and trend magazines available here is staggering. But did I walk away with In Trend Dresses or Vogue Collection Paris or Textile Report? Heck no. I had to pick up the latest issue of People, so I could read the cover story on kidnapping victim Jaycee Dugard. Beach reading!